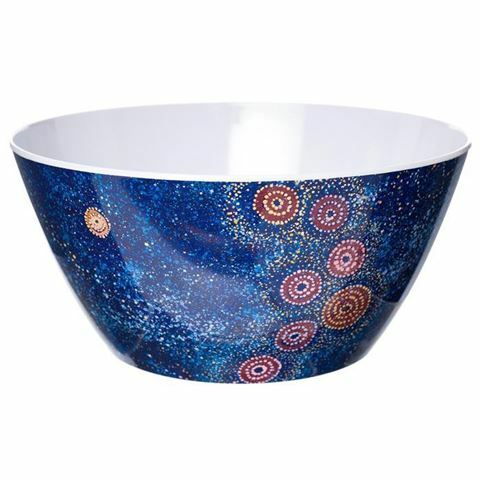 Lovers of Indigenous art will be impressed with this beautiful but practical, melamine salad bowl, which utilises art work by Alma Granites, an artist who’s part of the Warlukurlangu artists’ community from the remote desert areas of Yuendumu and Nyirripi in Central Australia. The art work on this salad bowl is from one of Granites’ pieces entitled Star or Seven Sisters Dreaming, which includes a deep blue expanse of the sky at night and may inspire you to new heights of creation. Design: Star or Seven Sisters Dreaming.